The building consists of two adjacent rectangular sections of equal width; one approximately 14 m (45 ft) in height, and the other approximately 18 m (60 ft) tall, creating a tower relative to the lower section. A three-wythe loadbearing masonry wall separates the two sections of the building and serves as the exterior wall of the tower where it extends above the roof of the lower portion of the building. Both building sections are steel framed; however, the spandrel beams of the tower rely on the masonry demising wall for bearing (without benefit of steel columns). The roof framing for the tower and lower portion of the building also rely on the masonry demising wall for support. 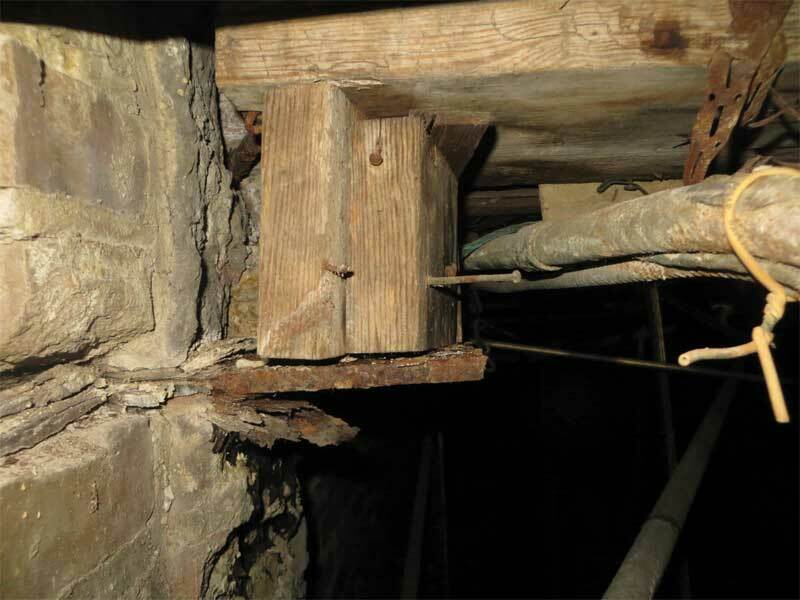 Close up view of wood jack studs supporting double 2×12 wood “lintel” intended to support masonry wall above opening—jack studs bear on steel bearing plate for spandrel beam undermined by brick removal. 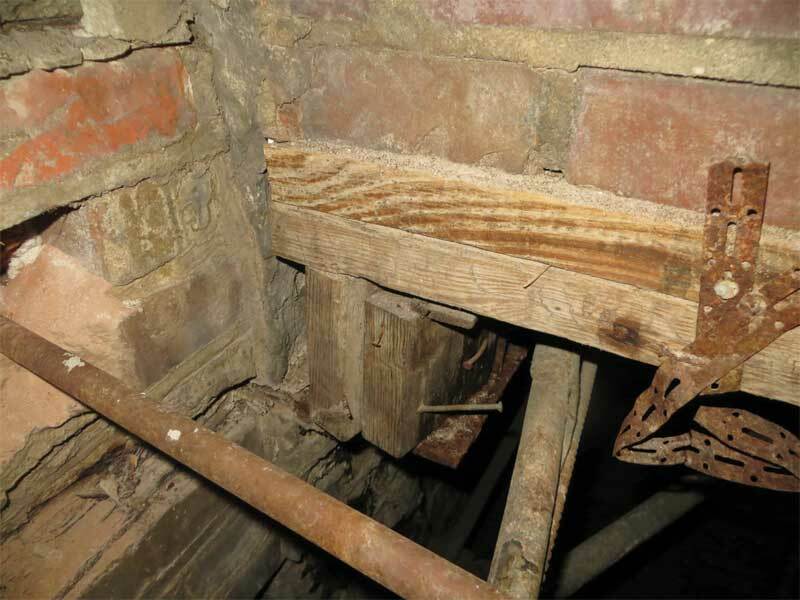 During the investigation it was discovered several openings had been made in the loadbearing masonry demising wall directly adjacent a common exterior wall where the demising wall terminated, apparently to accommodate the passage of mechanical ductwork (which has long since been abandoned and removed). One such opening, approximately 1.5 m (5 ft) wide and 1 m (3 ft) in height, occurred directly adjacent the common exterior wall of the building; creation of this opening undermined the end support for a spandrel beam. Recognizing the masonry above the opening needed to be supported, the contractor who created the opening fashioned a lintel utilizing two 2x12s laid flat (in the weak direction) supported at each end by two 2×4 jack studs. The jack studs at the edge of the opening adjacent the exterior wall rested on the top of the undermined steel bearing plate for the spandrel beam; however, no supplemental support was provided for the bearing plate itself. Support of the masonry above other openings made in the demising wall was also discovered to be insufficient or non-existent. 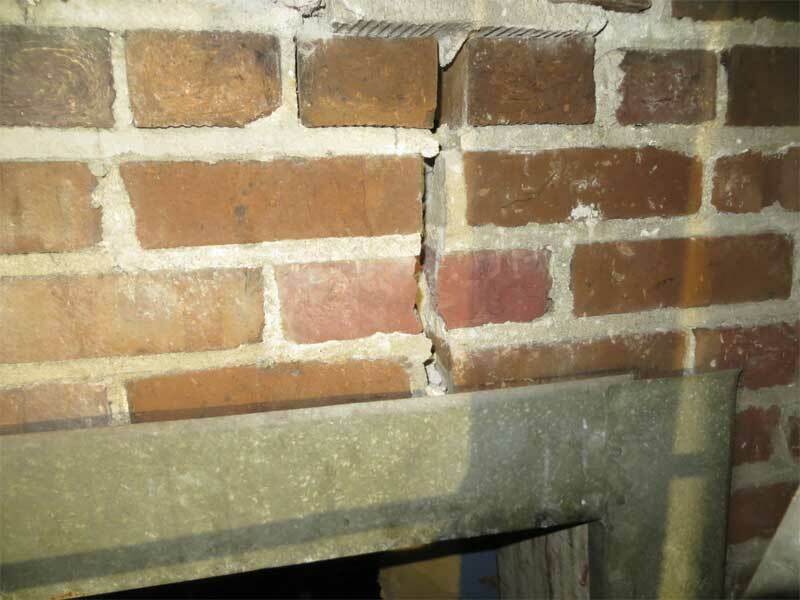 Example of resultant cracking of masonry wall above the opening caused by insufficient support by wood “lintel” and undermining of spandrel beam support, which also caused outward movement of the exterior masonry wall. The undermining of the wall’s integrity, and insufficient support of the masonry, are evidenced by significant cracking that has occurred in the masonry above the opening, as well as outward movement of the exterior wall adjacent the demising wall. These conditions raise the question: what were they thinking when these modifications to the demising wall were made?